It hasn’t been a super productive winter at STHFLATM. The 2-stroke snowblower failed me, then it worked, then it failed me again when I really needed it. The thing had basically shaken itself apart. I put it back together, it works again. I used loctite this time. The big monster snowblower started before the snow fell. It too failed me when I needed. I’m going to have my small engine guru buddy get it fixed properly. I think I’m going to sell them both next year and go battery powered. I’ve been really happy with my battery powered mower. I finally ordered an exhaust system for the red Kymco Super 8 150 scooter in back. It’s been on a battery tender with the tank and float bowl empty. It should be ready to rock with an oil change and the exhaust system installed. The $100 Elite 80 that’s torn apart I have actually done some work on. It was last registered in 2009. I cleaned out the tank, replaced the fuel lines, and added a fuel filter. I know I should clean the carb, but it turns out Elite 80's are a total biatch to remove the carb. I’m just going to add some Seafoam and send it. I got a new battery for it, so I need to put it back together and try to fire it up. 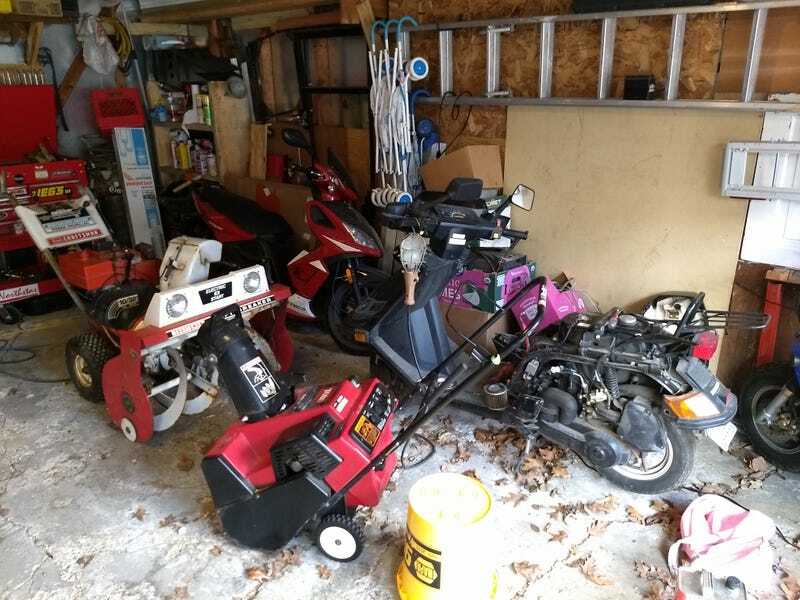 My buddy’s Zuma 50 to the right also won’t start.